Mexico City is one of the world’s largest cities, and the metropolitan area of Greater Mexico City (population about 22 million) extends well beyond the borders of the Federal District (Mexico City proper) into neighboring states. The city is ringed by hills. Homes have sprawled up the hillsides, often in a haphazard or unplanned way, gradually becoming established, densely-packed settlements of low cost housing, but often lacking adequate access by road for the number of people now living there. This is a particularly serious problem where settlements have been built on marginal land, in hazardous locations where the slopes are too steep or where the land is dissected by canyons. Given the terrain, it would be very expensive to improve road access sufficiently to ensure a smooth daily flow of commuters. Unfortunately, many of these areas of the city are not reached by the city’s metro system, so the only public transport is by using microbuses, colectivos or peseros (so-called because the fare was originally one peso). 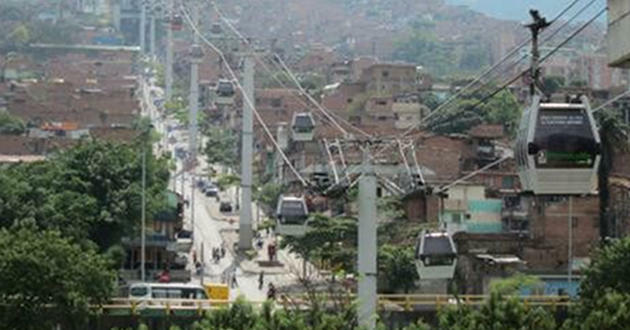 Earlier this year, officials from both the Federal District and the State of Mexico suggested that the answer to the transport problems of some of these marginal zones could be resolved by adding cable cars to the city’s transit system. Similar systems are already used in some cities in South America, including Medellín (Colombia). The State of Mexico is considering installing five cable cars (teleféricos) in different parts of Greater Mexico City. The proposed system, christened “Mexicable”, would have several lines between 5 and 7 km in length. Feasibility studies for the first two lines are already underway. 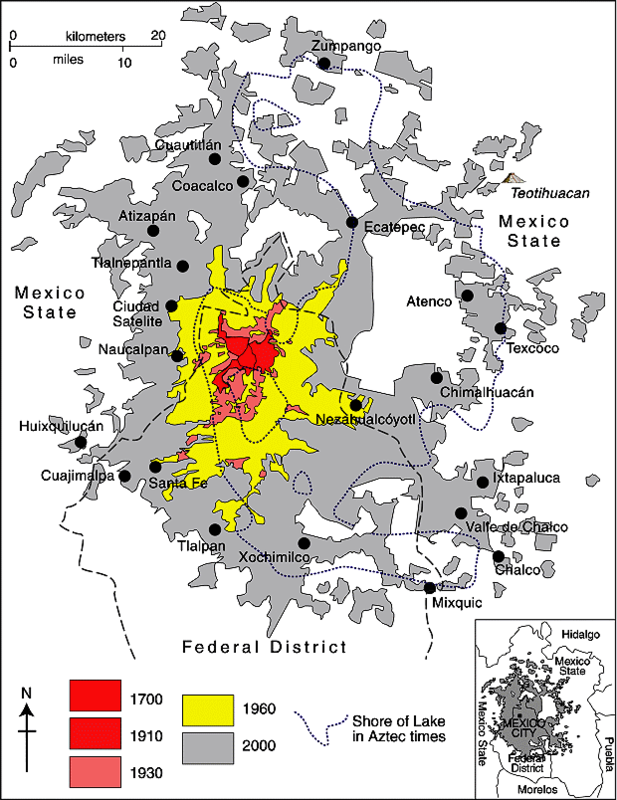 The first line, in the Ecatepc municipality (see map), would link San Andrés de la Cañada and la Sierra de Guadalupe, while the second line in Naucalpan would run between El Molinito and Chamapa. If approved, the state would help the municipalities concerned finance the construction of the cable car system, which would probably then be operated on a concession basis by a private operator. The initial proposal claims that between 50 and 60 cabins, each holding 8-12 people, would leave every 12 seconds or so, allowing for the movement of up to 2800 people an hour at peak times, and up to 20,000 people each day. The system is likely to cost around $5 million (dollars) a kilometer and could be operation before the end of 2014. The government of the State of Mexico has already committed $80 million towards the preparatory studies needed for the Ecatepec cable car system. In the Federal District, a similar system, known as “Cablebús”, is being touted an an integral part of a city-wide mobility program for the next five years. The first Cablebús would run from the Sierra de Santa Catarina to Iztapalapa metro station, in the south-eastern borough (delegación) of Iztapalapa, one of the lowest-income parts of the city. Unlike Mexico’s existing cable cars, in cities like Durango and Zacatecas, these systems are definitely aimed to serve the local people in their daily lives, and are not designed as tourist attractions. Commuting by cable car could soon become the accepted way to get to work for some residents of Mexico City, a more rapid and less-polluting alternative to existing transport options.